Today was a day I will never forget. I’ve participated in political rallies in my time, but none of them were as energized or as honest as this one. If you haven’t attended a TEA Party, or you avoided them because of what you hear on the news, you have truly been missing out. I didn’t know what to expect when I got there, but having been to the Clinton Nature Preserve in the past, at least I knew where I was going. As I turned off the interstate onto Post Road, there was no traffic. I thought it was a bit odd, but then I figured because it was Labor Day there might not be a high turnout. As I turned onto Ephesus Church Road there still wasn’t any traffic. I double checked the date on my iPhone to make sure I was in the right place on the right day (at the right time). I turned into the Clinton Nature Preserve and I found the traffic. Lots of it. There were people everywhere. I guess I just hit a lull in the traffic that was still on the road, because there were already hundreds of people milling about. If you’ve ever been to the Preserve you know they have several small meadows on the right hand side of the main road, and every one of those meadows was filled with cars before the event began. Organizers estimate 1,000 people showed up based on the number of people who registered when they walked into the event. I know for a fact that for every person who registered at least two people walked right by the registration table. I watched at least two dozen people walk by while I was registering. As I made my way down to toward the stage, I was stunned by the number of people I saw. The turnout was much greater than I thought it would be on a holiday, but then, like I said before I wasn’t really sure what to expect when I got there. I walked around taking candid shots of the crowd as I looked for a place to “set up camp”. I didn’t bring a lawn chair or a blanket (as was recommended) because I figured I would be standing to take photos most of the time anyway. Okay, I admit, I was lazy. I didn’t want to carry a chair or blanket with me while I milled about in the crowd. I found an excellent vantage point right up against a tree. I could lean against the tree for support, and there was a stump to the side of the tree I could stand on to get the height I needed to get clear shots over the top of people’s heads. 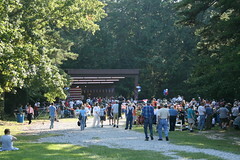 The Christian Community Orchestra was playing music as participants filled into the park. After the Pledge of Allegiance, the Orchestra played the National Anthem, and there were two elderly gentleman to my right side who were singing every word of the anthem and they sounded awesome. I have never heard the National Anthem sung so beautifully. My first instinct was to grab the Kodak Zi6 for video, but thought better of the idea out of respect for the song, and the gentlemen who were proudly singing it. Maureen Miller, the President of the Douglas County Republican Women’s Club, welcomed everyone to the TEA Party and Joel Aaron served as Master of Ceremonies. The first speaker of the evening was Retired Lt. Col. Beth Martinez who spoke about health care reform. While the current health care reform bill was a topic of discussion it is not solely the reason for the TEA Party movement. 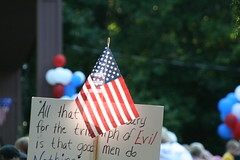 The TEA parties are held to protect our country and the Constitution upon which it was founded. They’re about educating people about what’s going on in Washington, then standing up for what’s right. Protecting our freedoms and stopping big government in its tracks. Brian Ott took some time out of his day to talk to the crowd about our Second Amendment Rights and then Bert Blood, a local small business owner, took the stage to talk about government, taxes, and small business. 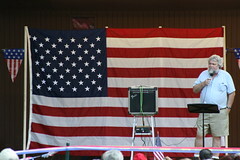 With the exception of Herman Cain, Bert was my favorite speaker of the day. He greeted us all by saying, “Good Evening all of you Right Wing Domestic Terrorists”. I saw Bert as I was pulling into the parking lot, as he drove up in his Smart car. Those things are small, and Bert is not a small guy. After listening to him speak tonight, I think he’s the perfect candidate for “Small Business Czar”, but then again I don’t think he’s radical enough to serve President Obama. He was just an ordinary citizen talking about the things that matter to me, another ordinary citizen. 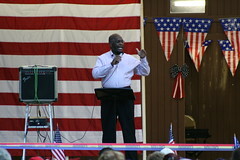 It wasn’t long before Herman Cain took the stage and the crowd went wild. He spoke about making the world a better place for others and the problems with the current administration. He reflected on issues important to him (and all of us) and what we could do as individuals, and as a group, to make our voices heard. 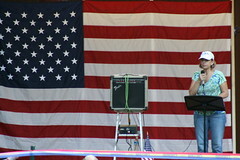 The Douglas County TEA Party was one of the most inspiring events I have attended in my lifetime. There was no shouting (well, other than by the speakers trying to make up for the weak public address system), there was no yelling, and there was no doubt that the TEA Party movement is growing. I took over 200 photos at the park, but uploaded the best 33 photos to my Flickr account. You can see them all there in the Douglas County TEA Party set. Maureen Miller and all of the organizers of the event did an outstanding job and should be commended for the work they put into organizing it. I met several different people at the event and a few of them knew who I was once I mentioned this blog. That was more stunning than seeing the number of people who showed up for some afternoon TEA. I personally think there were closer to 1,500 people at the park because it took well over 35 minutes just to get out of the parking lot. When I got home I set the DVR to record FOX5 News because I saw them interviewing people at the event. I was quite disappointed when I saw their coverage of the event. The following is the video that appeared during the 10pm broadcast. Apparently, members of the Douglas County Democratic Party aren’t the only ones filled with “misconfusion” as their Chairman James Quarterman calls it. FOX5 took the time to point out that TEA Party participants were protesting the health care bill and “other issues” and that speakers focused on individual freedoms and personal responsibility, but completely missed the mark when they interviewed James Quarterman but not one single speaker from the TEA Party. Sure, they interviewed a couple of the participants sitting in the crowd, but they didn’t take the time to even get a sound bite from Herman Cain (who just happens to carry a lot more credibility than Mr. Misconfusion). To make matters worse, the reporter appears to question whether the “strong message” sent by the protesters would “translate” when Congress takes up the health care debate again. For the record, the TEA Party was about personal freedoms, the Constitution of the United States, limited government, and holding politicians accountable for their actions. Sure, the current health care reform bill was a topic of discussion, but the media, especially FOX5 in this case, is trying to deflect attention from the TEA Party movement by shifting focus toward the health care reform debate. While I was visiting the FOX5 website, I noticed a second video on their site. Take a look. In the first video, it was a TEA Party, in this video it’s a “so-called” TEA Party. In the first video, the people on stage were “speakers”, in this video they are now “conservative activists”. In the first video there was one Democrat visible at the event. In this video, there was also one Democrat visible, but this time “a handful of Democrats” said health care reform is needed now. Where were the others and why did they edit out Mr. Quarterman’s “misconfusion” line? In the first video, Debbie Clark is a retired nurse who came to the event with friends from church, while in this video she’s just a retired nurse who disagrees. I guess, according to FOX5, church doesn’t matter either. 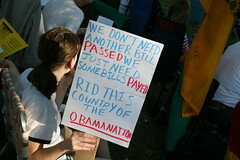 It’s no wonder that some people across the United States have an unfavorable view of the TEA parties. It’s no wonder people get the wrong ideas. It’s not that the mainstream media isn’t covering the events, it’s the fact they avoid the real story behind the TEA parties and then they edit their coverage to sanitize it for public consumption. I had a great time today and most of my friends (liberals and conservatives alike) would have understood the message delivered at the Douglas County TEA Party. Shame on you FOX5. Maybe next time you can stay in the studio, save gas, and write your own story. After watching these two videos I’m convinced you’re not going to report the real facts correctly anyway. I was at the registration booth last night and tried to get everyone to sign in or get a ticket. WOW, were we over loaded. It was an awsome night. I was angry though at the FOX 5 coverage. Why would they interview the dumbest person in the county? OY! Excellent post and 1000 times more accurate than Fox 5 News. I hoped they would report the event honestly but once again I’m disappointed with our news sources and their credibility is further tainted. I helped with parking and made it a point to be helpful to them. I’m still glad that I did even though they obviously came there with an agenda. I just pray that one day the people in the media will wake up from the stuper that they are in before it’s too late to undo all the damage that has been done in these first few months of office. Thank you so much for your wonderful blog about our little TEA! We worked very hard organizing the event and hope that everyone who attended, like you, views it as a success. Also, a big thank you goes out to the volunteers who made this event possible! Thank you Michael, for this great article on your blog! It’s good to see positive reaction to TEA Parties. Your encouragement to others who have never attended a TEA is certainly helping to get more people to stand up and be heard & counted. There were many, many people that helped to make this TEA such a success…. kudos to everyone in attendance! You are all Patriots!!!! !